Residents gathered at Mount Pleasant Church on Baltimore City line for first quarterly BPD Monitoring team community forum. 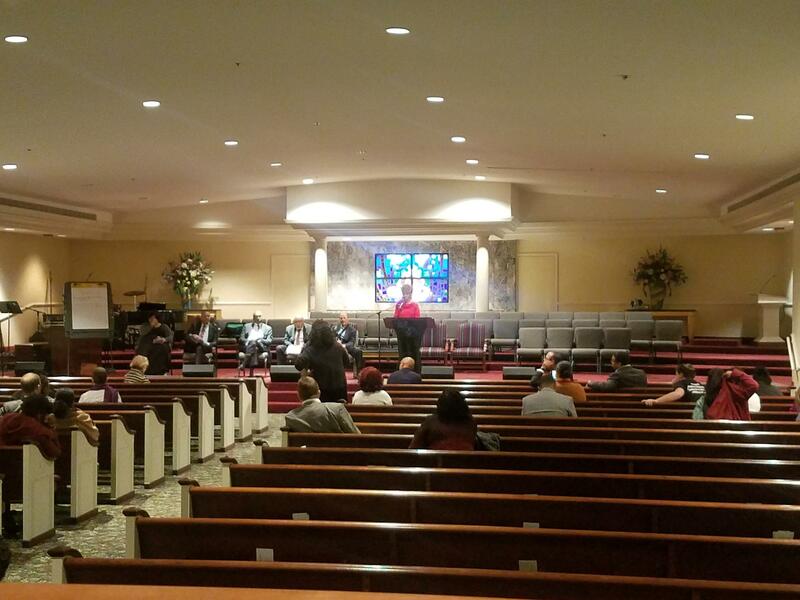 About 25 residents gathered at Mount Pleasant Church for the Baltimore City Police Department's consent decree monitoring team's first quarterly community forum Tuesday night. Ironically, that's the same church where the funeral for slain Det. Sean Suiter took place in November. Shantay Guy, one of the monitoring team members and executive director of Baltimore Community Mediation Center, said that was only a coincidence. She wasn't aware the church was the scene of the funeral. One of the residents complained that the location of the church--right on the Baltimore City/County line made it difficult to get to with public transportation. Team members explained their first-year monitoring plan. Hassan Aidan, one of the monitors, said the first priority the team looked at was transport vans. It was a transport van that was used in the in-custody police death of Freddie Gray which brought about the Department of Justice Investigation and now consent decree. “We inspected 16 of the 20 transport vans for equipment; both, restraint equipment, safety equipment, and video equipment,” said Aidan. For more than a year now, officers have been trained on driving vans, the requirement to seatbelt a prisoner in a van has been enforced and police are required to keep video from inside the vans for a year. Team members also said they were focusing on accountability, use of force and misconduct, given the revelations of systemic corruption in the Gun Trace Task Force trial. The monitors told residents they were looking at new policies that they, the judge overseeing their work and the public would be allowed to critique and provide feedback. The monitoring team says they will make those policies and the ability to give feedback on them available on their website. To contrast that, Gabriela Roque from Casa De Maryland, ask how the monitoring team can change policy without changing the culture that she said is at the root of the issues plaguing the department. Charles Ramsey, one of the monitors, used an analogy to explain confronting the culture change and needing to look at policy in tandem. “It starts with leadership,” said Ramsey. “But you got to start somewhere and you can’t shove the whole pie in your mouth at one time. You take a slice and you get started and the pie is still sitting there. And believe me you can look at me and tell I like to eat,” he chuckled. “I ain’t stopping till I eat the whole pie." Ramsey and the other monitors say they are looking to change the culture so officers are holding each other accountable for their actions and standing up for the values of constitutional policing. The investigation of the now disbanded Gun Trace Taskforce raised the issue of residents reporting complaints about officers that were never resolved. Erica Hamlett told the monitoring team of filing a complaint about an off-duty Baltimore City police officer who held her son at gunpoint in their yard in Howard County. she said the officers at police headquarters laughed at her and told her, "at least your son didn't die." She said she was treated like a criminal when she went for the interview with department officers. Team members said they were reviewing Hamlett’s case and others like it. The consent decree requires that complaints about officers should be resolved within 90 days of when the complaint was filed. At a press conference Wednesday morning, Police Commissioner Darryl De Sousa said he is looking into the way complaints are being handled. The monitoring team will hold a hearing with Judge James Bredar at the federal courthouse on Lombard Street in Baltimore to update him of their progress on Friday, April 13th. That meeting is open to the public. And the next quarterly meeting will be in July. The monitoring team is asking for the residents’ patience saying that the laundry list of issues won’t be resolved overnight. The monitors charged with reforming the Baltimore City Police Department have officially released a draft of their one-year monitoring plan.The plan comes after the monitors met with residents at multiple events throughout the city. 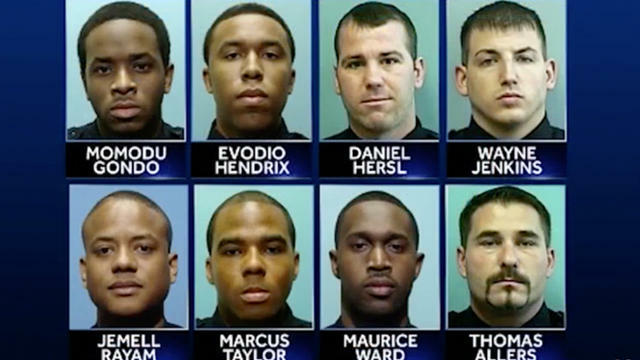 Two Baltimore police officers have been convicted of racketeering, robbery and wire fraud. 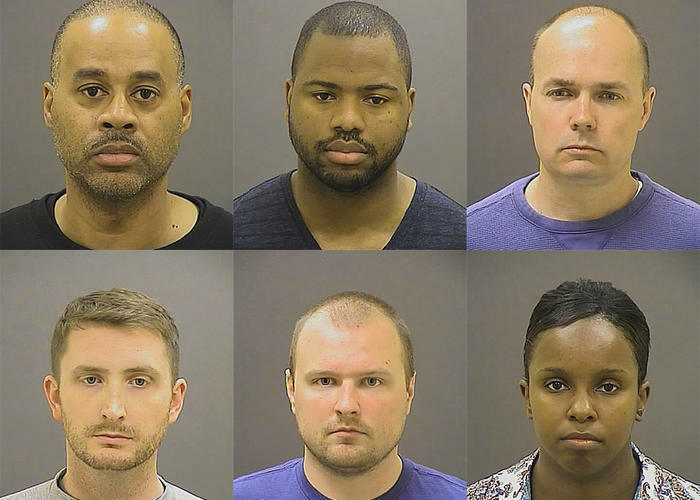 Those officers now face up to 60 years in federal prison. Mary Rose Madden from member station WYPR reports.